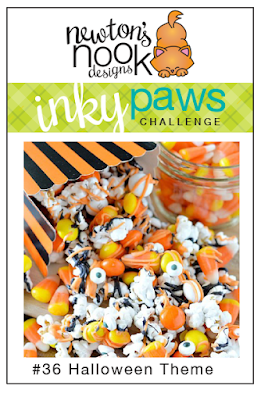 Inky Paws Challenge: Inky Paws Challenge #36 - Halloween! 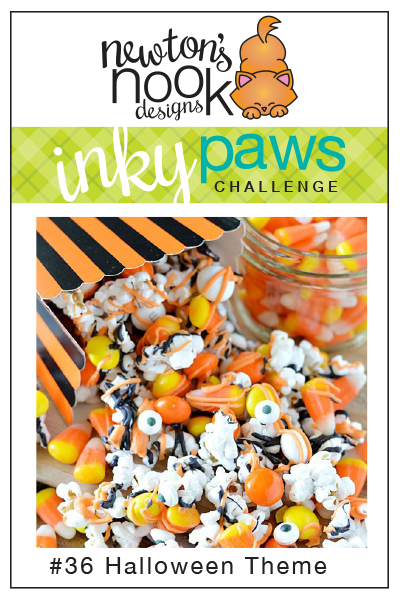 Create a project with a Halloween theme! You have TWO WEEKS to play along - Deadline to enter is Friday, October 7th, 2016 at Midnight CST. The winners will be announced on the NND blog. Post your project to your blog or to an online photo gallery such as Flickr, Pinterest, or splitcoaststampers (on splitcoast please use keywords newtonsnook and IPC36). Several of our Design Team Members decided to play along - check out all the awesome Halloween cards they created! Read the description below each card to see who made it. 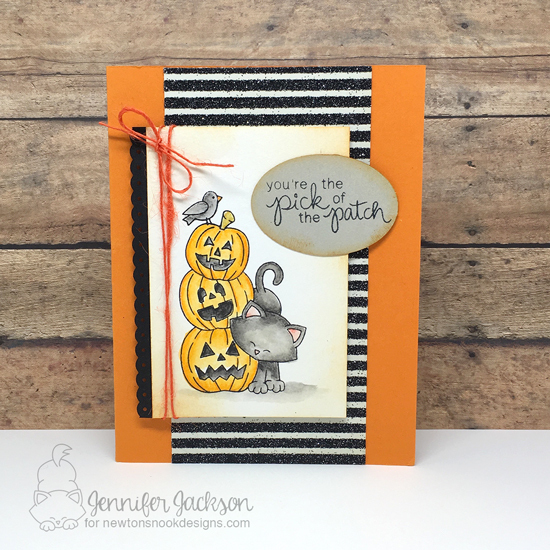 Naki created this super cute Halloween shaker card using our Newton's Perfect Pumpkin stamp set! I love the spiderwebs in the corners too! 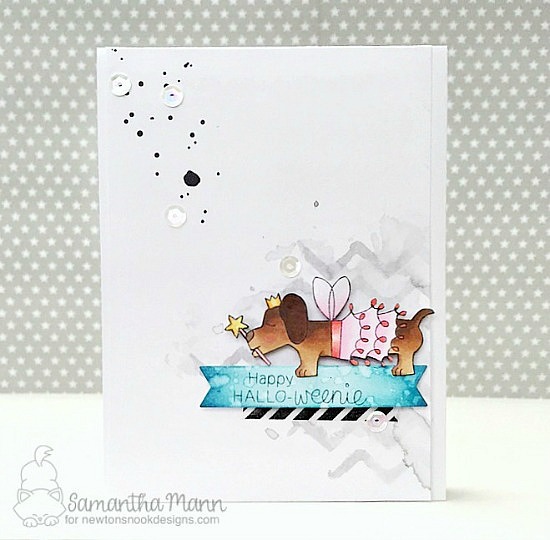 Samantha combined the pup in the tutu from our Boo Crew Stamp set with the "Happy Hallo-weenie" sentiment from the new Dress Up Doxies stamp set! Such a fun combo! This sweet kitty treat tote was created by Larissa using the new Newton's Boo-tiful Night stamp set! The fun newsprint paper is perfect for Halloween and it's so cool how she colored different colored pumpkins! Stephanie used our used the Newton's Boo-tiful Night stamp set with some fun bright halloween colors on her card! Do you see the tiny polka dots on the kitty, hat and broomstick that she paper pierced? 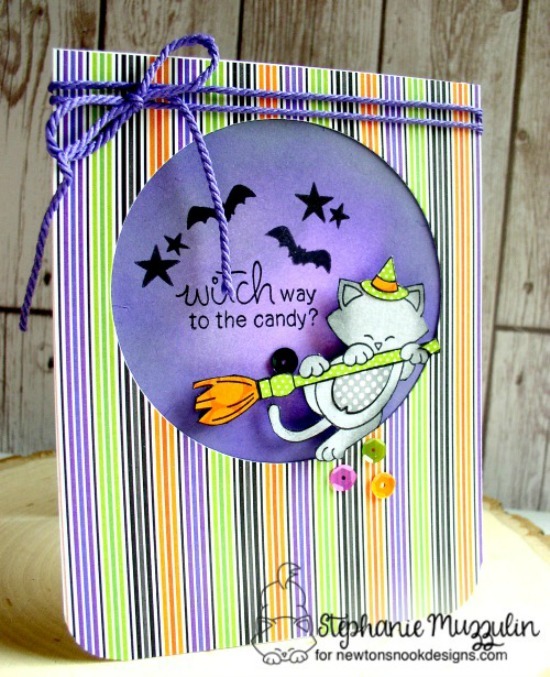 Yuki created this awesome Halloween Kitty card using our Newton's Boo-tiful Night stamp set. Isn't that vellum grass so cool? 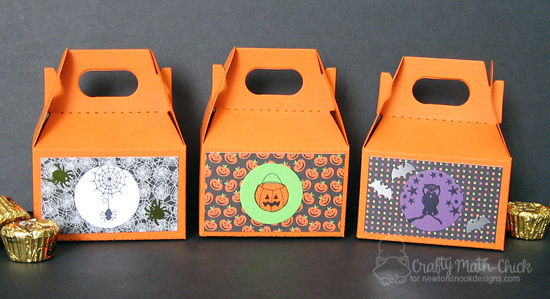 This trio of fun treat holders is by Crafty Math-Chick! She used a bunch of sets to create these. The spider and web are from the Newton's Perfect Pumpkin stamp set, the pumpkin is from the new Dress Up Doxies stamp set and the owl on the branch is from the Spooky Street stamp set. Here's a card by me :) I had so much fun watercoloring the kitty and pumpkins from our new Newton's Boo-tiful Night stamp set.